Another two photo’s. This time I (hopefully) have taught myself how to place them into the blog by uploading the original photo from Picasa 3 on the pc to our web album and back to Windows Live Writer before it finally gets uploaded to the blog. This is the Port (right) side of the boat. The stern is to the left in the photo. I’ve highlighted some features I’d like to mention. The arrow 1 is pointing to the recessed anchor point we will use to secure the <thinking of the word……..> “Fender”. There are three on each side just below the gunwale. You may get a better idea of the thickness of the baseplate at arrow 2. There are going to be hand grabs at arrow 3. These will assist boarding and alighting at the bow. Position 4 is the approximate location of the Camos sat-dome. 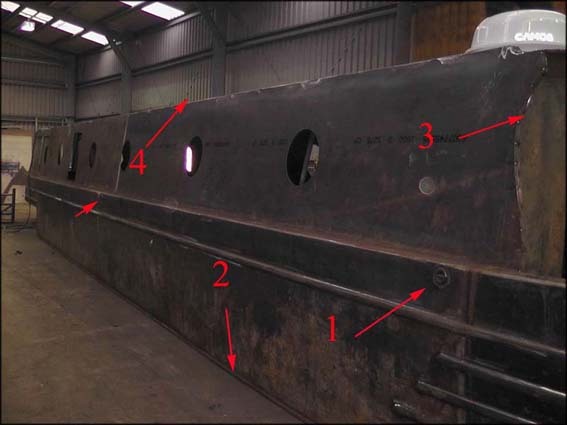 There are six 15” portholes and a side hatch. From the front they are; main bedroom, bathroom, saloon (2), side hatch in the saloon, galley, and finally the back cabin. A large and small rebated panel are at the rear. The smaller panel (arrow 1) has a porthole to provide light to the computer workstation which will be located inside. Arrow 3 points to the third fender mounting point whilst arrow 5 provides a better idea of the thickness of the baseplate steel. Although I believe this part of the boat is named the “swim”. Correct me if I’m wrong because I’m still coming to terms will the names of the various parts. The large panel (4) is where the boat name will go. Finally, at arrow 2 there is a steel bean across the top of the boat. It’s named the “boatman’s beam”. The roofline handrail is cut away Immediately in front of the beam to create a gutter. 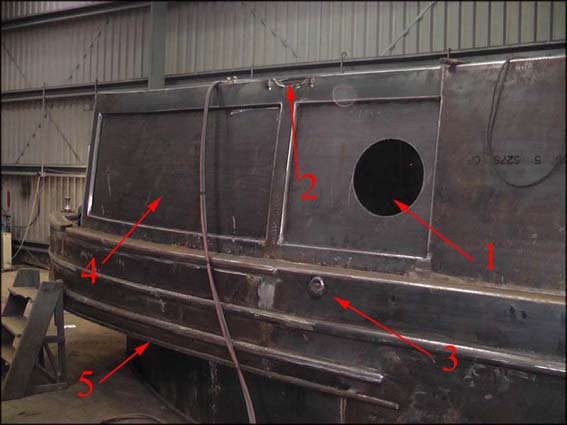 My assumption the beam not only provides some strength to the structure of the boat but also prevent water running the length of the boat before pouring into the open cockpit area. I had noticed our hire boat didn’t have this beam and when we cruised in the rain water tended to pour off the roof onto the deck at the rear of the boat.